FAS Begins April 1st, 2019 !!!!!!!! by Friday. March 29th, 2019 if you did not hear back about your On-Line registration! This is necessary to fill the classes and provide the very best instruction in Firearms Safety Education. New and available to all is an "On-Line Hunters Education class". "Click here to Register for the Traditional class on this site"
If over 21 and interested go to my Concealed Carry Page. Students are only allowed one absence with approval of your instructor. The On-Line Course has TWO Buttons, One for 11-17 year old and one for 18 and older. or just register after completion and receive the certificate. Students will sign in on this website and remembering their sign User name and Password, in can work at there own pace while completing the 15 chapters. Each chapter has an exam that must be passed before being allowed to progress to the next chapter. Once all chapters are completed a final test is taken on-line. Everything done up to this point is free to anyone interested in firearms safety, and will take approx. 15 hours if one passed each chapter exam and the final exam on there 1st attempt as all study is timed with a minimum time requirement and no maximum time requirement. At this point if one decides that this is the route they want their child to go, there is a payment to the host of the web site of $24.95 and upon making this payment a voucher of completion is then printed out with a registration number and instructions on how to continue to the next part of this process. Around the State of Minnesota firearms instructor groups are setting up what is called an "ALL DAY RANGE AND CERTIFICATION COURSE". There will many times be a fee of up to $7.50 to participate in this required activity. This fee will not cover the Firearms Safety Certificate you are looking to get. At the successful completion of this "ALL DAY" program a certification number will be issued to the graduating student that will then be used on the MN DNR web site (click on Buy a License and then look to the bottom of that page and click on "Safety Certificate Self Certification that you will find HERE, and upon payment of $7.50 Through a E-Check or Credit / Debit card OR there is a Telephone Number to call if one has no internet access, the number is [MN DNR License Center 651-297-1230 or toll free 1-877-348-0498] a Firearms Safety Certificate will be issued to the student at that time where-upon the 1st phase of a lifetime commitment to safe gun handling will begin. The applicants SSN will be required if it has not already been used on that website. You will have to Prue-register for this activity. This will be different than the RANGE DAY associated with a Traditional Firearms Safety Class because students in these traditional classes will have all the pre-requirements completed in the regular classroom setting. When one studies the on-line program there is no instructor student interaction, although in many cases there will be excellent student parent/guardian interaction but each student upon finding and pre-registering for the above mentioned "ALL DAY" program will do the required registration with parent or guardian present and providing identification in the form of passport, birth certificate or other state issued identifications. Then there is another "VERIFICATION EXAMINATION" to make certain this student did preform the on-line study that the voucher is claiming. Next each student will watch the required video, "THE LAST SHOT" A traditional class will have several more. Next the student will be instructed on all firearms handling disciplines and preform these disciplines (carry positions and firearm identification and operation skills)for the instructors. 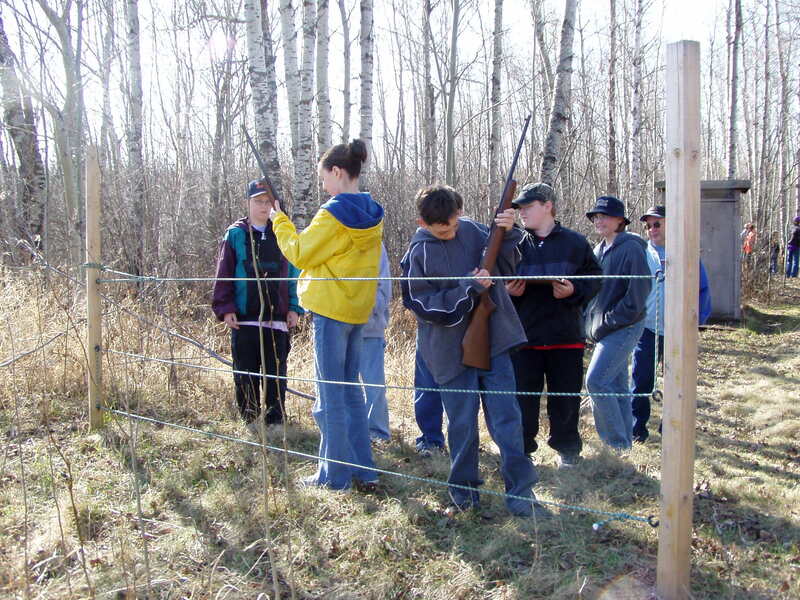 Next will be a hunters walking trail where each student will be presented with many shoot/no-shoot situations. Next will be a live fire exercise where each student will fire a minimum of 15 rounds of .22 rim fire ammunition. All firearms will be provided so no student should under any condition bring a firearm or ammunition to this "ALL DAY" program. and a hunters plan exercise among other activity's. You will be notified in the pre-registration if you will need to bring a lunch of if one will be provided. Each site will have some differences. To find a "ALL DAY" Range day activity near you. The Nashwauk area instructors may at some point in time offer one of these "ALL DAY" range day activity's, but are under no requirement by the DNR to do so. We have chosen to provide the Traditional classroom class just as we have been doing for the past 45 years. The cost of the traditional class is FREE, and there is a $7.50 registration fee that will be required for certification to the state of Minnesota. Optional fee of up to $7.50 can be collected by a "All Day range program for equipment. For a total of up to $39.95 for this new way of Certification.